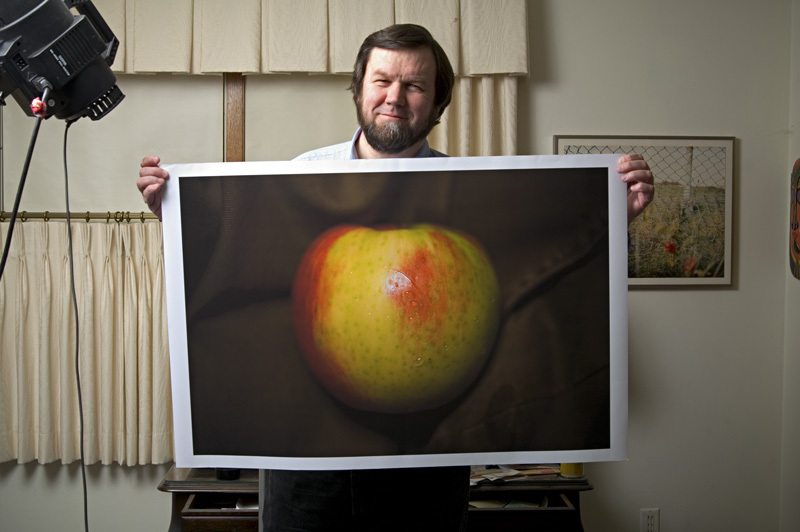 Here I am holding the largest of the five prints Paul made, which has an image area of 22" x 33". After I posted the entry below called "The Tiny-JPEG Fallacy," Paul Butzi generously offered to contribute to an experiment in print sizing. I uploaded the file of my picture "Surface Tension" (a name I picked out of thin air as I wrote the earlier post, by the bye, lest you think me pretentious) to the web, and Paul, out in Washington State, downloaded it and made five different prints of it at graduated sizes on his Epson 9600. All have a 2x3 aspect ratio, and the long dimensions of the prints are 7", 10.5", 15", 22" and 33". My initial reaction was that Paul really knows how to print. Although he says he did very little to my file other than running Noise Ninja on the largest two and sharpening for each output size, it seems obvious to me that he knows his printer and knows what he's doing. He warned me that it's difficult to go back to letter-sized prints once you've seen your work large, and I hear that. I was struck by how hard it was just to look at the smallest sizes—my tendency was simply to ignore them while admiring the larger prints. While Paul and I agree that the "ideal" size for this particular picture is the second-to-largest 22"-wide one, the biggest surprise is how well the largest two prints hold up. This is not an image with a lot of detail, and specular highlights like the water droplets on the surface of the apple can "convey" without having to be of very high resolution. Still, this is a 34-MB file from a 6-MP capture on an APS-C DSLR, and the first two people I showed the biggest print to both wanted to buy it. It's pretty amazing how good such a big enlargement from such a modest file can be. The 15"-wide print also looks very good, although I suspect I might be more satisfied with it if I had never seen the larger prints. is there now a bigger printer on your wishlist? I couldn't go back to 8.5x11 after getting my Canon S9000 (13x19). I suspect it's best I never see my work larger for the same reason. You look a lot younger than I had guessed. That is for someone with such a vast store of knowledge stashed in the noggin ! Geez! That thing looks like a blanket! I know at least one "expert" who claims that he can tell the inferior quality of a print resulting from a file that has less than 300 original dpi. According to this person, a 12.8MP camera such as Canon 5D should provide a print no larger than approx. 13" x 19" without giving up something in terms of quality. How much validity do you place to such claims? What is the general consensus among other "experts" out there? Any hints on how this was "rez'd" up so that print so large from a puny little file can be created in the first place?